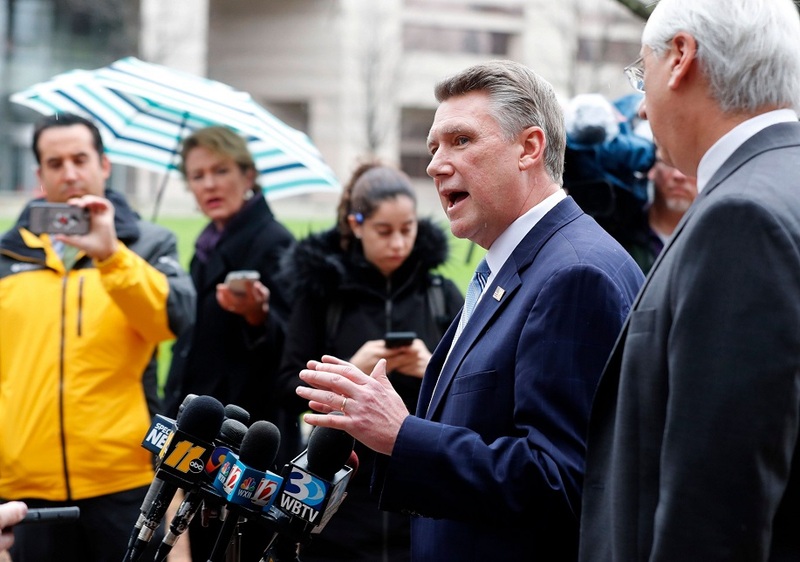 By Paul Specht on Monday, January 28th, 2019 at 10:57 a.m.
An investigation into North Carolina’s 9th Congressional District race will continue and so, it seems, will exaggerations about its findings. 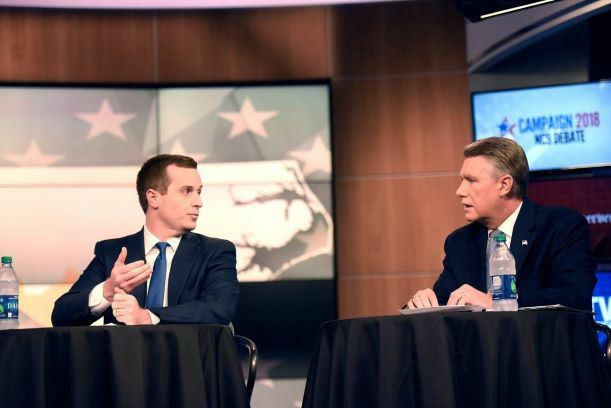 In November, the state elections board delayed certification of the contest between Republican Mark Harris and Democrat Dan McCready because it launched an investigation into voting irregularities. On Tuesday, a Wake County judge dismissed an argument from Harris that he should be seated because he has more votes than McCready. Afterward, the candidates and their political parties released misleading statements about the status of the investigation. "Mark Harris won the election," the NC GOP said in a Jan. 22 statement. According to unofficial and uncertified election results, Harris has 905 more votes than McCready. But the NC elections board, which has authority over the race, has not declared Harris the winner. Harris "received more legal votes," the GOP statement said. It’s unclear whether this statement is true. The NC elections board has said it is investigating "voting irregularities" in the race. That means some of the ballots could have been tampered with. Materials the elections board uploaded online suggest some absentee by-mail ballots could have been intercepted and destroyed. 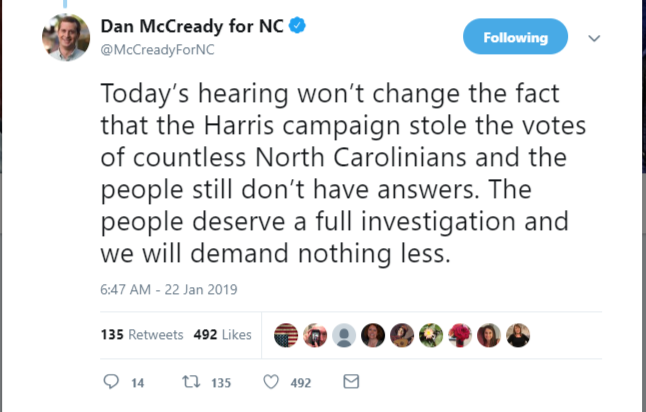 "The Harris campaign stole the votes of countless North Carolinians," McCready said in a Jan. 22 tweet. In a statement the same day, the NC Democratic Party said "Harris attempted "to silence voters across the Ninth district." To date, the state elections board hasn’t accused Harris, McCready or anyone of wrongdoing. The only person it has singled out by name is McCrae Dowless, who was hired by the Harris campaign. The elections board considers Dowless a "person of interest" but hasn’t recommended charges against him. "No evidence has been supplied that suggests the outcome of the race is in question," Harris said in his Jan. 22 statement. The NC GOP offered a similar statement, but limited its claim by referencing only "public evidence." It’s extremely unlikely Harris knows the extent of evidence that has been submitted to the NC elections board. And PolitiFact has already weighed-in on similar statements. It’s incorrect for anyone to allege there’s not enough evidence to change the outcome of the race. We simply don’t know if that’s true. The materials uploaded by the NC elections board include logs of absentee-ballot request forms, affidavits from people who claim to have witnessed or experienced election fraud, photos of text messages and other documents related to the election. And the portal doesn’t reflect the totality of evidence obtained by the NC elections board, spokesman Pat Gannon said in a phone interview Friday. The NC GOP might argue that, since the elections board hasn’t yet used the portal materials to implicate anyone in fraud, they shouldn’t be referred to as evidence. However, in a December press release, the elections board described the materials as evidence. In explaining its reasoning for posting the materials, the board said they "will post only if public disclosure will not undermine the investigation or prematurely expose sources. Postings should not be construed as dispositive or as representing the totality of evidence in the State Board’s possession." Harris has "cooperated fully with the state’s investigation of alleged ballot irregularities," he said in a Jan. 22 statement. Harris has "continued to obstruct the investigation," McCready’s campaign alleged in a Jan. 25 statement. In December, then-elections board chairman Joshua Malcolm wrote a letter to Harris’ attorney suggesting that Harris was dragging his feet in producing documents to comply with a subpoena. But on Jan. 3, Harris met with state elections board officials. Afterward, those officials released a statement saying they "appreciate his cooperation in the ongoing investigation." Materials posted in an online portal by the North Carolina State Board of Elections and Ethics Enforcement. Press releases from the North Carolina State Board of Elections and Ethics Enforcement, "State board to hold public hearing into irregularities in 9th Congressional District contest," issued Nov. 30, 2018; "State board continues investigation into 9th Congressional District irregularities," issued Dec. 7, 2018; "Statement from Executive Director, " issued Jan. 3, 2019. A press release issued Jan. 22, 2019 by the North Carolina GOP. A Jan. 22, 2019 tweet by Dan McCready, Democratic candidate for NC's 9th Congressional District. 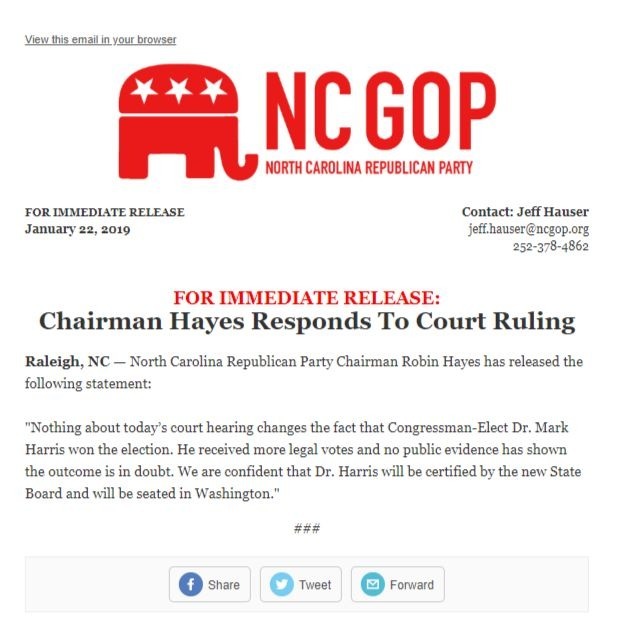 A Jan. 22, 2019 press release by Mark Harris, Republican candidate for NC's 9th Congressional District. Stories by The News & Observer, "NC elections board refuses to certify 9th District race, leaving it in limbo," published Nov. 27, 2018; "Curious NC: Answering your questions about alleged election fraud in the 9th district," published Dec. 10, 2018; "‘No reason to doubt the legitimacy of the outcome,’ Harris says as he sues to join Congress," published Jan. 3, 2019; "Who's who in NC's 9th District election fraud investigation," published Jan. 11, 2019; "Judge denies Mark Harris request to certify his win despite election fraud investigation," published Jan. 22, 2019. Story by the Charlotte Observer, "9th District chaos: Cooper plans interim elections board, Harris asks to be named winner," published Dec. 28, 2018. Fact check by PolitiFact NC, "NC GOP misleads about NC election fraud investigation," published Dec. 4, 2018.